Sinn F�in Councillor Christopher Jackson with late Sinn F�in leader Martin McGuinness and Mark O' Doherty and Joe McWilliams, board members of Na Piarsaigh Doire Trasna GAC pictured previously looking at the plans for the new pitch. Doire Trasna Development Officer Mark O’Doherty described the announcement of the club’s new pitch and changing room complex as bringing Derry GAA one step closer to its ancestral home. Following Wednesday’s approval by the Council, construction on the new pitches and changing room facilities on the site of the former Immaculate Conception College on the Trench Road could get underway as soon as two or three weeks. The new pitch will have an entrance off the Corrody Road, the very location of the famous St Patrick’s Waterside club that existed even before the official formation of the GAA in Derry back in 1888. “Today we are one day closer to the day Gaelic games in Derry comes back to their ancestral home on the Corrody road in the Watersid,” said a delighted Mr O’Doherty. “Back to the fields and the lanes which once hosted one of Derry’s most successful clubs, St. Patrick’s Waterside. The project involves the upgrade of the existing playing pitches to provide a new grass, floodlit GAA pitch, with changing facilities and the refurbishment of the existing all-weather, multi-use pitch. “On behalf of our club and the community, I would like to thank everyone who has helped to bring us to this day,” added Mr O’Doherty, “From the council, for embracing our project, to the councillors for their endorsement but most of all to the people from all shades of opinion who sat on the Social Investment Fund steering group and who believed in our vision and backed our bid for funding. “When Martin McGuinness and Peter Robinson set up the Social Investment Fund it was specifically aimed at projects within communities which had the best chance at succeeding in changing the lives of those communities for the better. A Derry County Board spokesperson also welcome the announcement saying it was vindication for the ambitious vision of the Waterside club. “Derry GAA welcomes the decision of Derry and Strabane District Council to grant planning permission for the modernisation of the facilities available to Doire Trasna CLG. “The decision demonstrates great confidence in a club and community that have shown vision and leadership over many decades in what is one of the earliest known cradles of Gaelic games in county Derry,” said the spokesperson. “The development and strengthening of Gaelic games in urban areas is a key strategic goal of both Derry and Ulster GAA. Coupled with our continued investment in coaching and games development in the council area, the provision of the new facilities will be a huge boost to the health and wellbeing of the local community, as well as a social hub for its people. 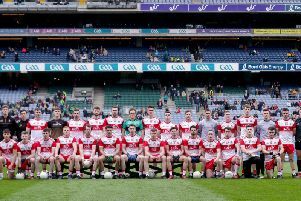 “We commend the progress achieved to date, the partnership between our development committee over recent years, public representatives and the management committee of Doire Trasna who have worked tirelessly together to secure a permanent home for the club.